The Audi A8 is a four-door, full-size, luxury sedan manufactured and marketed by the German automaker Audi since 1994. Succeeding the Audi V8, and now in its fourth generation, the A8 has been offered with both front- or permanent all-wheel drive—and in short- and long-wheelbase variants. The first two generations employed the Volkswagen Group D platform, with the current generation deriving from the MLB platform. After the original model's 1994 release, Audi released the second generation in late 2002, the third in late 2009, and the fourth and current iteration in 2017. In 1982, Ferdinand Piëch signed an agreement with Aluminum Company of America. The objective was to design and develop a car that would be substantially lighter than any other vehicles in its class (to compensate for the fact that standard all-wheel drive was around 100 kg (220 lb) heavier than competitors' rear-wheel drive). In the late 1980s, it was decided that the target vehicle would be a successor to the V8 (Typ 4C) flagship introduced in 1988. By 1990, a final design by Chris Bird and Dirk van Braeckel was chosen and frozen for series production in mid-1991. In September 1993, the Audi Space Frame (ASF) Concept was unveiled at the 1993 Frankfurt Motor Show (IAA) as a D2 Typ 4D prototype in polished aluminum. Pilot production began in December 1993 and development ended in early 1994, at a total cost of $700 million (£418.1 million). The Audi A8 (Typ 4D) was presented in February 1994 and debuted at the 1994 Geneva Auto Show in March, with full-scale factory production commencing in June 1994,[clarification needed] although it was not until October 1996, for the 1997 model year that it became available in North America. Unlike its predecessor, the Audi V8 model, which was built on an existing steel platform, the A8 debuted on the then-new Volkswagen Group D2 platform, an all aluminium monocoque, marketed as the "Audi Space Frame" (ASF), which helped to reduce weight and preserve structural rigidity. The saloon/sedan was offered in both the A8 (standard wheelbase), and the A8 L extended or long-wheelbase (LWB) version. The A8 L adds 5 inches (127 mm) of rear legroom. Updates to the car in 1997 included the addition of six interior airbags. The A8 was designed as a competitor to fellow German rivals Mercedes Benz S Class and the BMW 7 Series. In 1997, Audi introduced the first series production electronic stability control (ESP) for all-wheel drive vehicles (Audi A8 and Audi A6)– the world's first production cars with both front and rear side airbags. For 1997, the new A8 was available with either front-wheel drive (FWD), or the Torsen-based quattro permanent four-wheel drive. The FWD models are powered by a 2.8-litre V6 engine, producing 142 kW (193 PS; 190 bhp), and a 3.7-litre V8 engine producing 171.5 kW (233 PS; 230 bhp), while the quattro received a 4.2-litre V8 producing 220 kW (299 PS; 295 bhp). The A8 is available with standard luxury amenities, including dual-zone climate control, wood and leather interior trim, 14-way power and heated seats, and an enhanced Bose audio system. In 1999, Audi's flagship received side curtain airbags, new colours, and restructuring of option packages. The North American "warm weather package" added a solar sunroof which allows the interior ventilation fans to run, keeping the interior cool while the car is parked with the engine turned off. Changes to all models included a larger passenger-side mirror, and a first aid kit located in the rear centre armrest. In 1999 for the 2000 model year came a minor front-end restyle, with new, larger, clear headlights, a revised grille, and lower front valance with standard projection fog lamps. On the interior, the seats received a new, horizontal stitch pattern. Also, the 3.7-litre V8 FWD model was dropped, leaving the 2.8 V6 model and the long-wheelbase and short-wheelbase 4.2-litre quattro. These restyled cars also featured revised external door handles and an integrated radio antenna. For 2000, the North American A8 line-up was expanded to include the A8 L.
In 2001, Audi introduced its new W12 engine, a compact 6.0-litre unit developed by effectively mating two VR6 engines together at the crankshaft. The engine quickly became available in the A8, though only to European and Asian customers. From its introduction through its discontinuation in 2003, only 750 of the D2 "W12" models were produced. 2001 also marked the debut of the high-performance S8 variant in North American markets. In 2002, the A8 L received standard xenon high-intensity discharge lamp (HID) headlights, and a heated steering wheel. A tyre pressure monitoring system (TPMS), an updated Symphony II stereo, and new exterior colours were also added. For 2002, all A8 variants received a trunk/boot interior release lever to facilitate escape in the event an individual became trapped within. In 1997, IVM Automotive of Munich, Germany built a two-door Audi A8 Coupé. The car was unveiled at the 1997 Geneva Motor Show. Audi contracted IVM to build the prototype, and was considering production of the vehicle. The coupé had a re-engineered aluminium body, shorter than the production A8 saloon. Like the Mercedes-Benz CL-Class, there was no central "B" pillar, giving the car a seamless design with a gradually sloping roofline. The car included custom leather seats which could seat four. Ultimately, Audi decided not to put the A8 Coupé into production, citing lower-than-expected sales figures for the similar BMW 8 Series (E31) and Mercedes-Benz S-Class Coupé. Only one A8 Coupé was ever built. The single prototype, painted in a colour called "Ming Blue pearl", remains the property of IVM Automotive, and resides in Munich. Its last public appearance was in 2002 on a series of test drives. Audi introduced the S8 4.2 quattro into the European market in 1996. The S8 followed the naming convention of other high-performance Audi "S" models such as the Audi A6-derived S6 and was similar in vein of Mercedes-Benz AMG models. In markets such as the UK, the S8 was only available with the automatic transmission. Cosmetically, Audi differentiated the S8 from the A8 with solid aluminium alloy door mirror housings, chrome-effect beltline and lower front grille trim, and polished twin exhaust pipes, along with subtle "S8" badging. 14-way power adjustable and heated sports front seats with memory function were fitted as were heated rear seats. Standard alloy wheels were 18-inch cast aluminium alloy "Avus" six-spoke style. After the 1999 facelift, 20-inch polished nine-spoke RS wheels became an option. In 2002, 18-inch nine-spoke RS wheels became a no-cost option. The D2 series S8 featured an uprated, 250 kW (335 hp) version of the 4.2-litre V8 with four valves per cylinder. From late 1999, Audi increased this to five valves per cylinder with power increased to 265 kilowatts (355 hp) and 430 newton metres (317 lb⋅ft). From launch in 1996, European-market models came standard with a six-speed manual transmission. A sports-recalibrated version of the ZF 5HP24 five-speed tiptronic automatic, featuring "Dynamic Shift Programme" (DSP) was released a year later and was the only transmission available in most other markets. A retuned, 20-millimetre (0.8 in) lowered sports suspension included a 30 percent stiffer spring rate and 40 percent more compression damping in the shock absorbers. Speed-sensitive "servotronic" power assisted steering was also standard. The brakes featured Bosch 5.3 anti-lock braking system (ABS), with electronic brakeforce distribution (EBD), and worked radially ventilated front discs. From 2002, an upgraded Bosch 5.7 electronic stability programme became standard fitment. The second-generation Audi A8 (Typ 4E) built on the Volkswagen Group D3 platform was unveiled via press release in July 2002 and introduced in November 2002 in Europe[unreliable source?] and in June 2003 (as a 2004 model) in the United States. The model was longer than the previous generation, with room for four or five large adult occupants in the cabin, depending on rear seat configuration. The D3 development program began in 1996, with the design process commencing in Ingolstadt in 1997. The whole Audi design studio based in Ingolstadt first contributed sketch proposals, from which numerous different themes emerged. Six of them were developed into full size clay models and worked up in a traditional manner adjacent to full size tape drawings. At least three one quarter scale models were produced to explore other design variations. The six full size exterior clay models were reduced to two in late 1998 and these continued to be refined in parallel for a year. At the end of 1999 the final theme selection was made, by Miklós Kovács and Imre Hasanic the main contributing designers. This lengthy development time was in part due to the body being made from aluminium, a material less able to take the small radii of sharp feature lines such as those on the (steel bodied) A4 (B6) designed in 1998. Grouping major controls nearer the driver for a more driver focused identity whilst creating a more airy and spacious feel were early priorities for the interior design team was headed by Jurgen Albamonte. This was in part facilitated by the Multi Media Interface (MMI) designed by Jurgen Schröder, that pioneered on the D3 A8 after the Audi Avantissimo concept car preview, and also by class leading colour and trim from Barbara Krömeke and Melinda Jenkins. 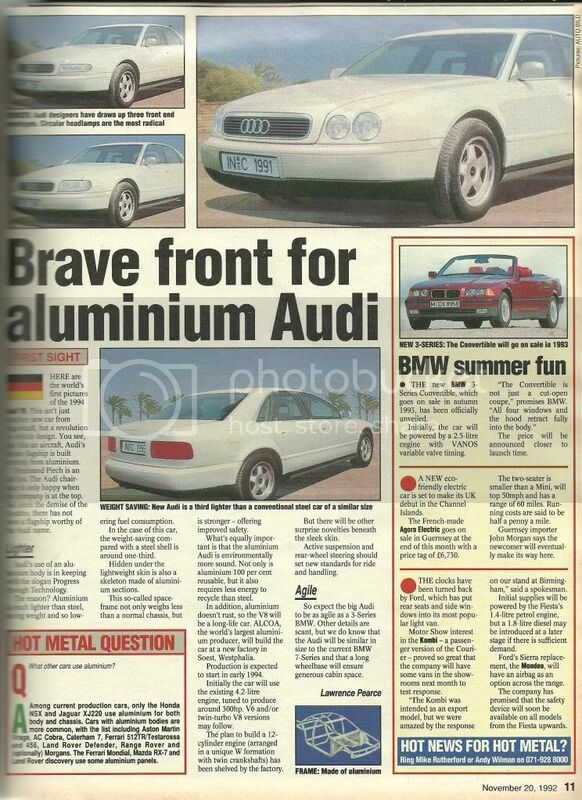 The A8 was previewed 2001 Frankfurt Motor Show by the Audi Avantissimo concept car. This concept introduced much of the technology later available on the series production A8 D3, including: Multi Media Interface, 6-speed automatic transmission with shift paddles, V8 biturbo engine (RS6), self-levelling adaptive air suspension with continuously controlled damping, electric park brake, bi-xenon headlights with static Adaptive Front Lighting System (AFS) curve headlights, dashboard, driver identification systems with fingerprint scanner. For quattro all wheel drive models, a ZF 6HP26-A61 (lower torque capacity 6HP19 version for 6 cylinder models) six-speed tiptronic automatic transmission with "Dynamic Shift Programme" (DSP) and "sport" mode, with optional steering wheel mounted paddle-shifters, is the only transmission offering. Output is transmitted via Audi's quattro generation IV all-wheel drive system using the Torsen T-2 centre differential with a default 50:50 torque split front/rear. If the road conditions change, the purely mechanical Torsen differential responds without any delay; it can divert up to 70 percent of power to the front or rear axles. First Audi with 4-wheel Adaptive Air Suspension and Continuous Damping Control (CDC)-(Skyhook suspension). In 2005, new internal combustion engines became available. For European and Asian market customers, the entry-level 3.0-litre V6 engine was replaced with a new 3.2-litre unit featuring Fuel Stratified Injection (FSI), which it shared with the Audi B7 A4 and Audi C6 A6. The top-of-the-line W12 version debuted that year. The advantage of the W12 engine layout is its compact packaging, allowing Audi to build a 12-cylinder sedan with all-wheel drive, whereas a conventional V12 could only have a rear-wheel drive configuration as it would have no space in the engine bay for a differential and other components required to power the front wheels. In fact, Audi's 6.0-litre W12 is actually slightly smaller by overall dimensions than the 4.2-litre V8. In addition to the added power trains, Audi restyled the D3 platform A8 range slightly in 2005, giving all variants a taller, wider trapezoidal single-frame grille. The top-of-the-line W12 engined W12 version was the first model to be equipped with this grille; V8 engined models were fitted with the new grille the following year. The D3 generation A8 introduced the 235 kW (315 hp) 4.2-litre Turbocharged Direct Injection (TDI) V8 engine (subsequently uprated to 240 kW (322 hp)). The engine uses two turbochargers and two intercoolers, with each turbocharger functioning exclusively for one bank of four cylinders. In September 2005 Audi became the first car maker to offer the 1,000-watt 14-channel ICEpower sound system option from Bang & Olufsen. Lane assist helps when the driver attempts to change lanes without signalling first. The S8 includes subtle detailing to distinguish it from its related A8. The trapezoidal "single-frame" grille bears the characteristic Audi "S model" vertical strut detail which are highlighted in a chrome finish. "S8" badging is displayed front and rear, whilst "V10" badges are displayed on each front wing above the side-repeater indicators. The rear boot-lid incorporates a subtle rear spoiler, and the rear is finished with four chromed oval exhaust tailpipes. Adaptive Xenon-plus high-intensity discharge (HID) headlamps include static turning lights, along with "swiveling" dynamic cornering lights. Daytime running lamps are five light-emitting diodes (LEDs) incorporated into a cloverleaf designed reflector, incorporated into the main headlamp housing. The D3 series S8 features a 5.2-litre all-aluminium alloy four-valves per cylinder V10 petrol engine. This engine is a derivative of the Lamborghini Gallardo's original 5.0-litre Lamborghini V10, which was also developed under the Volkswagen Group ownership. On this Audi-only variant, compared to the Lamborghini engine, it features a longer stroke and wider bore—which increases the displacement of the engine, and produces more torque at lower revs, making it more suitable for the larger and heavier full-sized luxury Audi application. It produces 331 kW (444 hp) and 540 N⋅m (398 lb⋅ft) of torque. By having its bore whittled out an additional 2 millimetres (0.1 in), displacement in the S8 application increases from 5.0- to 5.2-litres. The engine also features Audi's direct-injection system, called Fuel Stratified Injection (FSI). A sports-optimised ZF 6HP26-A61 six-speed tiptronic automatic transmission with "Dynamic Shift Programme" (DSP) and "sport" mode, with steering wheel mounted paddle-shifters, is the only offering. Output is transmitted via Audi's quattro generation IV all-wheel drive system, initially using the Torsen T-2 50:50 dynamic centre differential, and from 2007 for the 2008 model year, utilising the Torsen T-3 asymmetric dynamic centre differential, with a "default" torque distribution of 40 percent to the front axle and 60 percent to the rear. If the road conditions change, the purely mechanical differential responds without any delay; it can divert up to 85 percent of power to the rear wheels, and as much as 65 percent to the front wheels. The brake system consists of radially ventilated discs all round. The discs are clamped with gloss-black painted dual-piston calipers up front, and a single-piston sliding caliper at the rear, coupled to an electro-mechanical parking brake. A Bosch ESP 5.7 (later upgraded to ESP 8.0) electronic stability control, with ABS, brake assist, EBD complete the brake system. Optional "Audi ceramic" carbon fibre-reinforced silicon carbide (C/SiC) composite front and rear brakes are available, which use radially vented, and floating SGL Carbon discs, with anthracite grey painted twelve-piston fixed Brembo monobloc alloy calipers. Standard alloy wheels consist of 20-inch "S design" alloy wheels. The A8L Centennial Limited Edition (奧迪A8L百年限量版) is a limited (800 units total) version of the A8L 3.0 FSI with multitronic and the A8L 6.0 W12 quattro for the Chinese market, commemorating Audi's 100th anniversary. It includes a horizontal chrome-plated front grille (from the A8L 6.0 W12 quattro), "V6" metal logo at the upper left of the air-inlet grille (A8L 3.0 FSI), LED daytime running lights, heated leather steering wheel, 19-inch 12-spoke polished aluminium alloy wheels, heated steering wheel in grey leather with beige stitching, Bang & Olufsen advanced audio system, Alcantara equipment bag, Assam ash red veneer, floor mat with aluminium trim and a metal 'Audi exclusive' commemorative logo at inn door trims. In North America, only the 4.2 V8, 5.2 V10, and 6.0 W12 petrol engines are available. The 4.0 TDI was discontinued when the 4.2 TDI was introduced. The third generation of the Audi A8 was introduced in Miami on 30 November 2009. The chassis was built on the Volkswagen D4 platform. Full LED headlamps with Automatic high beam switching or Audi adaptive light (Xenon) with variable headlight range control. Enhanced MMI Multi Media Interface with touchpad & handwriting recognition for the phone and navigation system, using Nvidia Tegra system on a chip for very high processing speed. Optional 1,400 watt Bang & Olufsen sound system. Driver assistance systems networked using FlexRay technology. Hard disk drive GPS navigation with 3D computer graphics with Google Earth. Navigation system coordinates input to the adaptive headlights, transmission, adaptive cruise control and electronic stability control. Infrared Night Vision Assistant with pedestrian recognition. Broadband internet with UMTS 3G and WLAN-Hotspot. First production Audi with a Collision avoidance system: Pre sense (similar to Mercedes-Benz Pre-Safe). The full version of the system (Pre Sense Plus) works in four phases. In the first phase, the system provides warning of an impending accident, while the hazard warning lights are activated, the side windows and sunroof are closed and the front seat belts are tensioned. In the second phase, the warning is followed by light braking, strong enough to win the driver's attention. The third phase initiates autonomous partial braking at a rate of 3 m/s² (9.8 ft/s²). The fourth phase decelerates the car at 5 m/s² (16.4 ft/s²) followed by automatic deceleration at full braking power, roughly half a second before projected impact. A second system, called (Pre Sense Rear), is designed to reduce the consequences of rear-end collisions. The sunroof and windows are closed and seat belts are prepared for impact. The optional memory seats are moved forward to protect the car's occupants. The system uses sensor fusion with twin radar and a mono camera. and was introduced in 2010. The third-generation Audi A8 (L) (Typ 4H) is based on the Volkswagen Group MLB platform, but retains the Audi Space Frame aluminium construction of the previous A8, making it the lightest all-wheel drive car in the full-size luxury segment, while also giving it best-in-class fuel economy. The quattro all-wheel drive system splits torque with a default bias of 40 percent front and 60 percent rear. The vehicle was unveiled at Design Miami 2009 on 30 November 2009, followed by the 2010 North American International Auto Show. Early models include A8 4.2 FSI quattro (372PS), A8 3.0 TDI quattro (250PS), A8 4.2 TDI quattro (350PS). A8 3.0 TDI (204PS) was added later. Initial internal combustion engine options comprise 4.2-litre Fuel Stratified Injection (FSI) petrol and Turbocharged Direct Injection (TDI) diesel V8s, with 273 kW (366 hp) and 258 kW (346 hp) respectively. A 3.0-litre V6 TDI with either 184 kW (247 hp) or 150 kW (201 hp) will be available later. A 6.3-litre W12 engine only for the long wheelbase model was made available in 2010, and compared to its predecessor it has a larger displacement and direct fuel injection. All engines are mated to the new eight-speed ZF 8HP automatic transmission. Although other Audi vehicles such as the 2010 Audi S4 and 2011 Audi A7 had switched from the 4.2 L V8 to the 3.0 L supercharged V6, the Audi A8 retained a higher-output 4.2 L V8 as the base engine for the 2011 and 2012 model years in North America. The vehicle was unveiled in 2010 at the Geneva Motor Show. It is a version of the A8 L demonstrating 4G long-term evolution (LTE) broadband technology. Developed in collaboration with Alcatel-Lucent, the car's mobile broadband connection is a fourth generation (‘4G’) technology with data transfer speeds of up to 100Mbit/s. During the 2011 Consumer Electronics Show in Las Vegas, Rupert Stadler, Chairman of the Board of Management of AUDI AG, announced that LTE technology would be used in cars by early 2011. The A8 L prototype was unveiled weeks later. The vehicle was unveiled at the 2011 Geneva Motor Show. It is a limited (50 units) version of the A8 L W12 with seats upholstered in Cognac-colored leather by Poltrona Frau, inlays made from the wood olive ash natural, light gray-brown veneer, sill trims with "Audi exclusive concept" lettering, deep-pile carpeting. The long wheelbase version of the A8 hybrid was unveiled in 2010 at the Beijing Auto Show. The S8 can accelerate from 0 to 100 km/h (0 to 62 mph) in 4.2 seconds. It is powered by a 4.0-litre TFSI biturbo V8 engine with 382 kW (512 hp). The engine utilises cylinder deactivation so it can run as a V4 for better fuel economy. The S8's engine is shared with the Bentley Continental GT, while a detuned variant of the engine makes 420 hp which is found in the 2013 Audi S6, Audi S7, and Audi A8. Direct competitors include the BMW Alpina B7 and Mercedes-Benz S63 AMG, which also have biturbo V8 engines. The vehicle was unveiled at the 2011 Frankfurt Auto show, and went on sale in spring 2012. The Audi A8 3.0 TFSI quattro (290PS) was used in Transporter: The Series. Audi S8 was used in Avengers: Age of Ultron. Audi A8 was used in Spider-Man: Homecoming. As part of the 2013 S8 4.0 TFSI quattro launch in the US, a TV commercial called 'Suspect' was produced in association with Venables Bell & Partners, USA, Furlined, The Whitehouse, 740 Sound Design & Mix, Lime Studios; starring Abigail Spencer. The ad takes cues from quintessential heist films with the S8 taking center stage against a mysterious and suspenseful bank robbery scene. As the thrill escalates, viewers will be left deciding whether a true robbery has transpired, or if the scene was purely a figment of the driver's imagination. With the power, speed and innovation of the S8 at the driver's fingertips, it's easy to get carried away behind the wheel of an Audi S model. The spot closes with the tagline "Heighten Every Moment." The commercial was premiered during the 2012 NFL season kick-off game on 5 September 2012. The "Suspect" commercial featuring the Audi S8 also aired on CBS and NBC, and select cable networks, including: Food, FX, National Geographic, ESPN, USA, CNN, and AMC. A 30-second version would also be viewable on CNN.com, Reuters.com, Wired.com, Yahoo! and more. Multi Media Interface with faster Tegra 3-Processor and Long Term Evolution broadband Internet. First worldwide series production car with digitally controlled, full-LED glare-free adaptive highbeam: Matrix LED. The high-beam comprises 25 individual light-emitting diodes per unit that can be switched on and off or dimmed individually depending on the situation. This enables the headlight system to react extremely precisely to other vehicles while always brightly illuminating the road. Additional features of the new headlights are the intelligent cornering light, new-look daytime running lights and dynamic turn signals. The lighting system in the A8 uses predictive route data from the navigation system to adjust the distribution of light in response to the current driving situation. In combination with the optional Navigation plus with MMI touch, the system recognizes route data contained in the navigation system, such as curves and road classifications. Active noise cancellation (ANC) for A8 L W12 quattro, cylinder on demand with six-cylinder mode. The vehicle was unveiled at the 2015 Los Angeles Auto Show. As an April Fools' Day joke on 1 April 2015, Audi Japan announced a special edition A8 5.5 with a rice cooker on the rear center console. The 5.5 designation is a play on the Japanese words "go" (five) and "han" (half); when combined, they become "gohan" (悟飯), which is the Japanese word for "rice". Audi S8 was used in The Transporter Refueled. The design of the A8 and A8 L was based on the Audi Prologue concept. Changes include buttons being replaced by a touch screen, and self-parking. One new feature outside of the United States is Traffic Jam Pilot, consisting of level 3 autonomous driving at speeds up to 60 km/h (37 mph) when on a divided highway. Audi had planned to also include Traffic Jam Pilot in cars delivered to the U.S. starting in 2019, but cancelled those plans due to autonomous driving having a complicated legal, infrastructure and consumer environment in the U.S. The vehicle was unveiled at the Audi Summit in Barcelona on July 11, 2017, followed by the 2017 Frankfurt Motor Show. The petrol engines will be a 3.0 L TFSI V6 with 340 PS (250 kW; 340 hp), 4.0 L TFSI V8 with 460 PS (338 kW; 454 hp) and a 6.0 L TFSI W12 from the Bentley Bentayga, detuned to 585 PS (430 kW; 577 hp). Diesel engines will be a 3.0 L TDI V6 with 286 PS (210 kW; 282 hp) and lifted from Audi SQ7 and Bentley Bentayga Diesel, the 4.0 L TDI V8 with 435 PS (320 kW; 429 hp). Like the previous generation, all cars will feature all-wheel drive and an 8-speed Tiptronic automatic. As part of the deal between Marvel Studios and Audi, the fourth generation of A8 first premiered in the "Driver's Test" commercial that premiered on June 19, 2017, as a tie-in to Spider-Man: Homecoming movie. In the commercial, Peter Parker (Tom Holland) takes the car, a prototype belonging to Tony Stark, for a test-drive alongside his driving instructor played by J. B. Smoove. The car also had a small product placement appearance in the actual movie itself. ^ Ulrich, Lawrence (12 November 2010). "Speaking of Understatements". The New York Times. ^ Mateja, Jim (29 December 1993). "Audi Puts Aluminum-car Plans In Gear". Chicago Tribune. ^ "Renaissance of the rings". Retrieved 14 July 2015. ^ "Audi A8 :: Top Cars ::". Archived from the original on 15 July 2015. Retrieved 14 July 2015. ^ "Audi A8 Number 105,092 Initiates Change of Generation - AudiWorld". AudiWorld. Retrieved 14 July 2015. ^ a b "Audi A8 Design". Audi-Motors.net. 2006. Archived from the original on 9 September 2010. Retrieved 4 March 2010. ^ a b Livingstone, Sam. "The Audi A8 Design Story". Car Design News. Archived from the original on 11 April 2013. Retrieved 23 November 2012. ^ a b "2005 Audi A8 Review, Prices, Photos". New Car Test Drive. Retrieved 3 October 2010. ^ "adaptive air suspension". Audi A8 Betriebsanleitung [Audi A8 Operating Instructions] (in German). Audi AG. 2008. p. 151. ^ Krøyer, Kent (13 March 2005). "Audi med indbygget koncertsal fra B&O" [Audi with built in concert hall from B&O] (in Danish). Mediehuset Ingeniøren A/S. Retrieved 6 November 2014. ^ Chris Shunk RSS feed (5 March 2007). "A $685k Audi A8 that will blow its own doors off". Autoblog.com. Retrieved 8 April 2012. ^ "Audi A8 W12 and Audi S8 cancelled for 2010 | Cars UK | UK Car News". Cars UK. 25 April 2009. Archived from the original on 19 September 2010. Retrieved 3 October 2010. ^ "Review on CNet". CNet. 6 February 2009. Retrieved 20 October 2010. ^ a b "2007 Audi S8 – First Drive Review – Auto Reviews". Car and Driver. Retrieved 2 April 2011. ^ Clark, Michael (9 July 2009). "Inside Story: 2009 Audi S8". Canadian Driver. Archived from the original on 13 August 2009. Retrieved 12 November 2009. ^ "Sports Sedans Supreme: 2007 Maserati Quattroporte Executive GT vs 2007 Audi S8 vs 2007 Mercedes-Benz S63 – Latest News, Features, and Road Tests – Automobile Magazine". Automobilemag.com. 13 December 2010. Retrieved 2 April 2011. ^ "2009 Audi A8 4.2 V8, A8L, W12, S8 V10 – Used Car Review / Specs / Handling / Performance Parts". Jbcarpages.com. 3 March 2007. Retrieved 2 April 2011. ^ "Audi A8L Centennial Limited Edition". Retrieved 14 July 2015. ^ "AutoNet 汽車日報：AUDI A8L百年紀念版中國限量發售！". Retrieved 14 July 2015. ^ "Audi Considering 8-Speed Transmissions for Majority of Its Lineup". Archived from the original on 17 February 2010. Retrieved 17 February 2010. ^ a b c d "The new Audi A8 – The sportiest sedan in the luxury class". Archived from the original on 31 December 2014. Retrieved 30 December 2014. ^ "2011 Audi A8 4.2 FSI First Drive". Archived from the original on 11 February 2010. Retrieved 16 February 2010. ^ White, Joseph B. (20 January 2010). "Virtual Dashboards: The Next Must-Have?". The Wall Street Journal. p. B11. ^ "Extensive safety in the new Audi A8. Bosch predictive emergency braking system goes into series production". Archived from the original on 21 September 2010. Retrieved 2 June 2010. ^ Peterson, Thane (5 October 2010). "Review: 2011 Audi A8". Business Week. Archived from the original on 19 January 2011. Retrieved 2 February 2011. ^ "Winding Road - Comparison Test: 2012 BMW 750Li xDrive vs. 2012 Audi A8L 4.2". windingroad.com. Retrieved 14 July 2015. ^ "Audi Media Site : Home : Home". Audiusanews.com. 27 November 2009. Archived from the original on 25 October 2010. Retrieved 3 October 2010. ^ "World premiere of new Audi A8 in Miami". Audi AG. 27 November 2009. ^ "AutoNet 汽車日報：2010底特律車展報導：2011年台灣發表，大改款AUDI A8正式首演". Retrieved 14 July 2015. ^ "The new Audi A8 – The sportiest sedan in the luxury class". Audi MediaCenter. Archived from the original on 25 May 2013. Retrieved 14 July 2015. ^ "Audi A8 first drive". Retrieved 9 June 2010. ^ a b "AutoNet 汽車日報：聚焦領袖人士眼光，AUDI新A8頂級旗艦412萬起風雲登場". Retrieved 14 July 2015. ^ "AutoNet 汽車日報：2010北京車展搶先報：大改款AUDI A8 L首演，最快年底在台上市". Retrieved 14 July 2015. ^ "AutoNet 汽車日報：2010北京車展報導：AUDI A8L改款全球首演，最快年底台灣也看得到！". Retrieved 14 July 2015. ^ "AutoNet 汽車日報：2012台北車展AUDI搶先報：長軸經濟旗艦，A8L W12台灣豪氣首演". Retrieved 14 July 2015. ^ "The new high-tech flagship of the brand – The Audi A8 L". Audi MediaCenter. Archived from the original on 25 May 2013. Retrieved 14 July 2015. ^ "AutoNet 汽車日報：四環至尊降臨寶島，AUDIA8L W12 quattro頂級豪華科技旗艦即將在台上市". Retrieved 14 July 2015. ^ "AutoNet 汽車日報：頂級奢華旗艦再出擊，AUDI A8L V8 4.0 TFSI quattro 599萬極效上市". Retrieved 14 July 2015. ^ "AutoNet 汽車日報：總書記最愛！AUDI A8L豪氣進軍中國高級車壇！". Retrieved 14 July 2015. ^ Jonathon Ramsey RSS feed. "Geneva 2010: Audi A8 Hybrid a concept in name only". Autoblog.com. Retrieved 8 April 2012. ^ "The efficiency standard – the Audi A8 hybrid". Audi MediaCenter. Archived from the original on 5 March 2014. Retrieved 14 July 2015. ^ "AutoNet 汽車日報：2010日內瓦車展報導：A8 Hybrid、A1 e-tron概念現身，AUDI展示環保決心". Retrieved 14 July 2015. ^ "Audi A8 L Prototype gets state-of-the-art broadband connection". Audi.co.uk. 21 March 2011. Archived from the original on 31 August 2011. Retrieved 15 April 2012. ^ "Audi A8 prototype gets broadband internet capability". Worldcarfans.com. Retrieved 15 April 2012. ^ "Audi A8 with broadband Internet connection". Audi-mediaservices.com. 16 February 2011. Retrieved 15 April 2012. ^ "High-Security Audi A8 planned for High Contingency". AudiSite.com. 16 February 2011. Retrieved 21 February 2011. ^ Jeff Glucker RSS feed (16 February 2011). "Audi A8 L Security blends serious protection with luxury and style". Autoblog.com. Retrieved 8 April 2012. ^ "Audi Canada". Retrieved 14 July 2015. ^ "Audizine: News: High-security version of the Audi A8 soon to be launched". Retrieved 14 July 2015. ^ "Audi's A8L Security So Bombproof, It Can Even Survive the Phaeton". Car and Driver. 18 February 2011. ^ "AutoNet 汽車日報：頂級房車再進化，A8 L Security科技行動堡壘！". Retrieved 14 July 2015. ^ Sebastian Blanco RSS feed. "Audi spills the beans on production 37 mpg A8 Hybrid". Autoblog.com. Retrieved 8 April 2012. ^ "Pakete > A8 > Audi Deutschland". Retrieved 14 July 2015. ^ "Consistently efficient – the Audi A8 hybrid". Audi MediaCenter. Retrieved 14 July 2015. ^ "2011法蘭克福車展搶先報：AUDI A8 Hybrid量產現身，年底進軍Hybrid市場". AutoNet. 25 August 2011. ^ "2011法蘭克福車展報導：悍動世界的環保豪華旗艦，AUDI A8 Hybrid全球首演". AutoNet. 15 September 2011. ^ Drew Phillips (15 September 2011). "Audi adds more luxury to the A8L W12 with the Exclusive Concept". Autoblog.com. ^ "Car stars shine at Auto China 2010". Retrieved 14 July 2015. ^ a b Jacquot, Josh (26 October 2011). "2013 Audi S8 First Drive". Insideline.com. Retrieved 25 May 2012. ^ "Driven: 2012 Audi S8". Fourtitude.com. 16 November 2011. Retrieved 25 May 2012. ^ "2012 Audi S8 – 2012 Audi S8 First Drive Review on". Roadandtrack.com. 7 September 2011. Retrieved 25 May 2012. ^ "New 2013 Audi A8 4.0T Premium 4dr All-wheel Drive quattro Sedan for sale in Richmond, British Columbia | LP Auto". Newcars.lpauto.ca. 1 May 2012. Archived from the original on 12 May 2013. Retrieved 25 May 2012. ^ "AutoNet 汽車日報：AUDI S Model高性能家族新作， S8頂級性能旗艦房車傲視降臨". Retrieved 14 July 2015. ^ a b "The Audi A8 Pricing and Specification Guide Valid from April 2012" (PDF). Retrieved 15 April 2012. ^ "JC & Associates Communications, Inc.-case studies". Archived from the original on 15 July 2015. Retrieved 14 July 2015. ^ "AutoNet 汽車日報：殺進小螢幕，AUDI A8繼續擔任「玩命快遞」主角座駕". Retrieved 14 July 2015. ^ "Osram: You'll see more LED headlights". Automotive News. Retrieved 14 July 2015. ^ Steven J. Ewing. "Audi adds 420-HP 4.0T V8 to A8, upgraded 3.0L TDI to Q7 for 2013". Autoblog. Retrieved 14 July 2015. ^ Seyth Miersma. "Audi confirms four new TDI diesel models headed for US". Autoblog. Retrieved 14 July 2015. ^ Steven J. Ewing. "Audi prices 2014 A8L TDI from $82,500*". Autoblog. Retrieved 14 July 2015. ^ Noah Joseph. "Audi also calling in A8, S8 over sunroof issue". Autoblog. Retrieved 14 July 2015. ^ "Audi S8: Suspect". Archived from the original on 15 July 2015. Retrieved 14 July 2015. ^ "Q: Who is the hot girl in the Audi S8 "Suspect"..." Retrieved 14 July 2015. ^ Zach Bowman. "S8 ad to air in NFL kickoff game tonight as Audi recommits to Super Bowl". Autoblog. Retrieved 14 July 2015. ^ "Composure redefined – the Audi A8". Archived from the original on 29 December 2014. Retrieved 29 December 2014. ^ "The A8 Audi exclusive concept". Audi MediaCenter. Archived from the original on 7 December 2013. Retrieved 14 July 2015. ^ Viknesh Vijayenthiran. "2015 Audi A8 And S8 U.S. Specs Announced". Motor Authority. Retrieved 14 July 2015. ^ Greg Migliore. "Autoblog - We Obsessively Cover the Auto Industry". Autoblog. Archived from the original on 25 January 2015. Retrieved 14 July 2015. ^ "More composed than ever – the new Audi A8". Audi MediaCenter. Archived from the original on 5 March 2014. Retrieved 14 July 2015. ^ John Neff. "2015 Audi A8 rises to meet the challenge [w/video]". Autoblog. Retrieved 14 July 2015. ^ Chris Bruce. "Refreshed 2015 Audi A8 starts at $77,400*". Autoblog. Retrieved 14 July 2015. ^ "The new Audi A8 L Security – Supreme protection for passengers". Audi MediaCenter. Archived from the original on 14 July 2014. Retrieved 14 July 2015. ^ Noah Joseph. "Audi reveals new beefed-up A8 L Security". Autoblog. Retrieved 14 July 2015. ^ "Audi reveals new A8 technologies, tightens links with Porsche - SAE International". articles.sae.org. Retrieved 31 December 2017. ^ "Audi Japan debuts special edition A8 featuring a rice cooker". Audi. 1 April 2015. Retrieved 5 January 2019. ^ "Why the 2019 Audi A8 won't get Level 3 partial automation in the US". Roadshow. 14 May 2018. Retrieved 25 September 2018. ^ "Spider-Man: Homecoming - Peter Parker Takes His Driving Test". Marvel. Retrieved 30 July 2017. ^ "Audi A8 in "Spider-Man: Homecoming"". IMCDb.org. Retrieved 30 July 2017. ^ a b "Volkswagen AG Annual Report 2008" (PDF). Archived (PDF) from the original on 10 January 2011. Retrieved 2 February 2011. Wikimedia Commons has media related to Audi A8.